Midfielder Alan McCormack is back in contention for a place in the Hatters squad ahead of their League Two trip to Stevenage on Saturday. 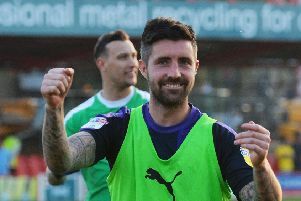 The 34-year-old has been missing for almost five months, with his last game coming against Wycombe Wanderers on September 16 due to a number of injuries. However, he has made a successful return to training, and speaking to the press this afternoon, Jones said: “McCormack is available. “We would have liked to given him game time on Tuesday (against Bedford in the Beds Senior Cup), but with the conditions, we thought it was better we trained them here. On whether McCormack can start a match for Luton just yet though, such is has his lack of game time recently, Jones continued: “When he’s ready to come back, we want him to play, we need him to play minutes. “So I’d have no problem in putting him in from the start if he was fit and ready to go. “What I wouldn’t want him to do is not be ready and break down again and make a sub after 10, 15, 20, 25 minutes, whatever it is. “So once he’s ready we’ll know that. It’s easier once you’ve actually seen them in a game, but because we train as hard as a game, it’s not like he hasn’t had the minutes. “It’s just getting them ready and psychologically letting him know and us know that he could start in a game and then putting him in. “We want everyone to be available for the first team, but to be available for the first team, they have to have trained enough to played minutes in games, so that’s the only thing. “We saw that with Danny Hylton at the beginning of the season, where the only time we could get minutes into him was first team games, so he took a good bit of time to hit the ground running. Although Jones saw Ipswich loanee Flynn Downes give a superb debut performance in the 1-0 win over Exeter City last weekend, he still wants McCormack available to increase the competition for that holding midfield role. The Town chief said: “We want all our best players available. “He was brought in here to do a job and because of injuries that’s been curtailed and we haven’t quite got it. “I want all of them available and I want the headaches of picking the squad and the team as much as I possibly can. Meanwhile, on the return of McCormack, team-mate Luke Berry added: "He's been training, he's a good character to have around the place he's always talking and giving advice to the young lads, so it's good to have him back."